This beautiful Victorian home in Port Gamble, Washington is stately and beautifully designed. It has not been used as a residence in many years. In 2008 a group interested in paranormal activity came and definitely felt the presence of “ghosts” in the house. Built in 1888 it was the home for William Walker, master mechanic,and his wife Emma, daughter Maude, and son-in-law Edwin Ames. The house was close to the mill so Walker was nearby in case of emergencies. Ames was the resident manager from 1883-194 and then general manager until 1931. This is the rear of the house. It faced the waterfront to welcome ships and captains. When I was teaching Interior Design at The Art Institute of Seattle, I had the good fortune to teach a class called Adaptive Reuse. My students had the choice of redesigning this or another structure. It was wonderful to see this elegant home come to life as a Wine Bar, a Bed & Breakfast, a Wedding site and several creative venues. It is too bad that zoning makes most of that impossible and for the most part the building sits empty and sad. Here is a photo of the house in it’s 1888 glory time. There are no color photos from that time for obvious reasons. I love to draw historical houses and places and you will see more of these in the future. 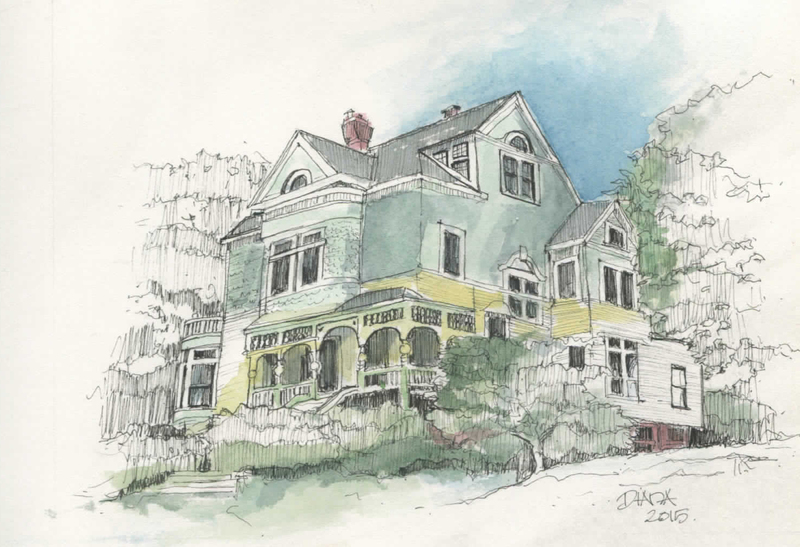 My drawings are available for purchase at Liberty Bay Gallery in Poulsbo, or from me.